What it’s about: Soo-Ja dreams of traveling to the capital of Korea to study as a diplomat, but her parents object, wanting her to follow a traditional path of marriage and family that will bring her comfort and stability. Soo-Ja devises a plan: she’ll marry a weak man, one who will let her make all the decisions and won’t stand in her way. When she meets Min, a young student swept up in a protest movement and a member of her own class, she thinks she’s found the perfect target. Min seems madly in love with her and promises to follow her to Seoul. Soo-Ja agrees to their marriage, only to be approached the next day by Yul, a handsome doctor who is also a part of the protest movement and who once saved Soo-Ja’s life. Yul asks for her hand as well, warning her not to marry Min, but Soo-Ja believes she’s made the right choice. Min will take her away from the confines of traditional Korean life. Or so she thinks. Three years later, Soo-Ja knows differently. Trapped in a loveless marriage and forced to serve ungrateful in-laws, Soo-Ja’s only joy is her daughter, Hana. She will do anything to build a better life for her child, even if it means bowing to the very doctrines she tried to escape. And Yul is always in her mind and sometimes in her life, reappearing as if by providence when she needs him most. Soo-Ja knows she can never leave Min if she hopes to keep her daughter. Korean law will give custody to the father and leave her with nothing. Bound to Min, Soo-Ja must give up everything else—her ambitions, desires, and even her dignity—to hold on to her daughter. 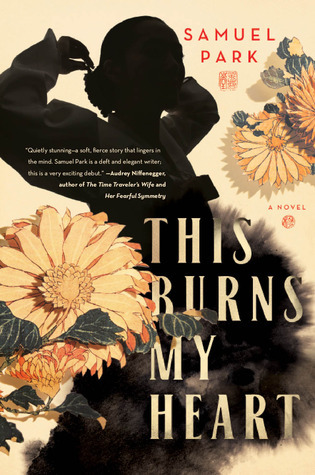 A troubled love story, This Burns My Heart explores the aftermath of choosing the wrong person, what it means to live with that decision, and how we go on with life, even as our hearts burn. So, the plot of This Burns My Heart is by no means revolutionary. I’ve read my fair share of books about Asian women searching for love in a patriarchal oppressive society, variously set in China and Japan between 1850 and 1980. This version takes us to Korea and is set a bit on the late side, post-Korean War and into the 1970s. The tropes of the genre are still there: the sacrifice of love for duty, the domineering mother-in-law, the repression of the female perspective. That said, I still enjoyed This Burns My Heart. It’s greatest redeeming factor is Soo-Ja’s voice, which is raw and intimate. This book is less about the particulars of Korean society, only touching on some of the details of cultural practices, but it’s not really meant to be a portrait of a place in the way that Memoirs of a Geisha or Empress Orchid were. This book is far more internal and, at its core, a romance novel. Would I recommend? Sure! I think I’d wait for the paperback release, but as a light summer read I’d endorse This Burns My Heart. I don’t typically read romance novels, but this one was well done, with just the right balance of forbidden, repressed desire and hope and a compelling heroine to give the story depth.